for $699,900 with 4 bedrooms and 3 full baths. This 4,926 square foot home was built in 1960 on a lot size of 23..94. Spectacular Mid Century Modern home designed by noted Augusta architect, John Sanderford. Modeled after a Frank Lloyd Wright type of home, this stucco home is situated along a rocky creek. Known as Cedarside, this spacious home has stunning views from every room. Glass paneled sliding doors open from each room unto the flagstone patio & sunlight floods the interior. Solid Cypress paneling grace the Formal Living room & Dining Room. Living room has large mirrored section above fireplace, Dining room wall is lined w/Mirror Paneling along one wall. Terrazzo Floors throughout the first floor of Den, Kitchen, Living Room & Dining Room. 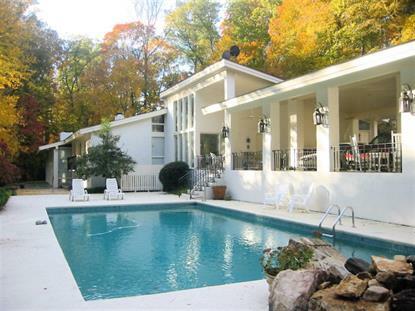 Huge Master Bedroom w/deck over looking inground pool & stream that runs along the Woods edge. Pool diving board is a slab of rock from the creek. Large Den w/Tile floors & 3rd fireplace is currently used as an office. Sauna Room w/jetted tub, shower, sky lights, & entry to an outdoor shower. Second kitchen near 6 car carport w/loggia at end.